(AINA) -- Police authorities in the Egyptian village rampaged by a Muslim mob on November 15, torching some 22 Coptic houses, came to the conclusion that the fires came about haphazardly as an "act of fate." The Bishop of Nag Hammadi, Anba Kyrillos, rejected the police explanations of the cause of the fires, saying "An act of fate caused 22 houses to be torched? An act of fate also caused torching of shops, a storage house and a large number livestock not near each other?" He added that the two Coptic-owned fields and irrigation machinery were torched one day later, "so was this also an act of fate?" The Chief prosecutor went to survey the damage in Al-Nawahed village, Abu-Tesht, in Qena province, 290 miles south of Cairo, but he refused to listen to any of the Coptic victims, speak to witnesses who saw the perpetrators or even register the names of the accused. The Bishop expressed anger at yet another injustice befalling the Copts, saying "Does the chief prosecutor want to register the case against 'unknown persons?" The Bishop filed a complaint with the Attorney General against the chief prosecutor of Abu-Tesht for refusing to investigate charges brought by Copts against the Muslim perpetrators named by them, and asked for the re-opening of the investigation. Coptic village inhabitants were subjected to Muslim mob rampage on November 15th and 16th, prompted by a rumors of an affair between 19-year-old Copt Hossam Noel Attallah and a 17-year-old Muslim girl, Rasha Mohamed Hussein (AINA 11-17-2010). 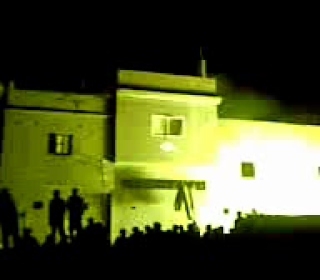 During the attack the Muslim mob threw fireballs, gasoline and stones at Coptic homes and detonated Butane Gas cylinders This video shows Muslims torching a Coptic Christian home while shouting "Alahu Akbar" and the terrified inhabitants of the home taking refuge on the roof of the burning house. The Bishop accused the village mayor Tantawi Abdelmoneim and others of planning and inciting to the incident. He denied that these attack could have anything to do with the Egyptian parliamentary elections slotted for November 28. It was reported that State Security forced thirteen Coptic families to sign papers stating the fire happened as an "Act of Fate" and was extinguished by security and the village Muslims. "Have you ever heard of such humiliation? said a Coptic victim "Whoever refused to sign was beaten up. We were afraid to be detained by security, so we signed" he added. He confirmed that the police know all of the perpetrators. None of the Coptic village inhabitants had any information as to the whereabouts of the Muslim girl, Rasha. However, they said that Hossam is still detained by security and was tortured and taken for treatment to the military hospital in Qena. One of the village Copts told local Coptic activist Miriam Ragy that Copts are hiding on the roofs of their torched homes, afraid to venture in the street to buy food lest they be killed by Muslims. "We are sending a call to anybody to come and save us. We cannot wait here until we are slaughtered," he said. "Everything was burnt out in our homes, we sleeping overnight on the roofs where it is freezing cold." The Bishop explained that the Coptic inhabitants are poor peasants who are traumatized and afraid to be ambushed if they go out, but said security forces now have the situation in the village under control. "What is really worrying," says Wagih Yacoub, "is the police now going to Coptic homes taking down the names of males over the age of 16 years." He explained that security authorities will eventually detain them to force the Copts into reconciliation to get their boys out. "It is the same old trick used by security over and over again, in order to force unofficial reconciliation where Copts are forced to give up their rights." Bishop Kyrillos decried the fact that every time there is a rumor of a relationship between a Coptic man and a Muslim girl, the whole Coptic community has to pay the price. "It happened in Kom Ahmar (Farshout) where 86 Coptic-owned properties were torched, in Nag Hammadi we were killed and on top of that, they torched 43 homes and shops and now in Al-Nawahed village just because a girl and a boy are walking beside each other in the street, the whole place is destroyed," he said.